Merely to say that unschooled Oakland photographer Mike Brodie has an eye would understate the richness of the work he shows at Wirtz. Parts of a series Brodie calls "A Period of Juvenile Prosperity," these pictures record his penniless early 20s experience in the last decade, riding freight trains and hitchhiking around the country, sleeping rough and scavenging for food with a changing cohort of young drifters. Almost no trace remains in Brodie's pictures of riding the rails as a mid-20th century dream of freedom. Some of his fellow travelers wear nothing-to-lose face tattoos. All seem to accept grime as the natural patina of railroad nomads' life. Gallery visitors may fixate on the hardship and danger that Brodie and his untethered friends appear to welcome. But his keen shutter reflex and intuitive vision sees beyond the obvious risks and finds - or founds - a distinct pictorial poetics. Look at "Untitled #4566 from 'A Period of Juvenile Prosperity' " (2006-09). Brodie appears to have shot it from the driver's seat of an old pickup truck. 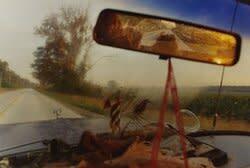 He captured the road ahead, with a sunset at his back making a golden rectangle of the rearview mirror, a deep blue strip of windshield tint above it. But internal echoes among details hold the picture together. A feather propped on the dashboard chimes with a clump of roadside trees ahead, with the windblown hair of riders in the truck bed and even with the scratches and smears on the rear window through which we glimpse them. The child, almost a toddler, making to suckle in "Untitled #3733 ..." strikes a pose we might see in Baroque painting. Such pictorial graces usually befall only an experienced artist such as Lee Friedlander. They abound, manifested very diversely, in Brodie's work. Emphasis shifts in the present selection from portraiture to social document to discovered metaphor, as in the "Untitled #5806 ...," where a snow-covered roadway and rail tracks shoot toward different vanishing points. Any camera worker might take pride in the range of construction, observation and emotional temperature that Brodie's work displays. He makes it all look easy, yet the pictures' narrative content says otherwise. Heinser from on high: German photographer Thomas Heinser, who lives in the Bay Area, looks like a formalist compared to Brodie. The angle of vision in a picture such as "SF Bay_017" (2013) gives priority to the image's crossing diagonals: the Bay Bridge with a container ship cruising beneath it. But that formalism, which surfaces in other ways elsewhere in the show, evokes an almost agnosic viewpoint, one seeking meaning as much in the chance criss-cross of ship and bridge, as in their familiar utility. Several images of airport runways compose their markings as if they might yield a secret meaning, like land drawings of a lost civilization. Either through low exposure or by shooting under overcast or by raking sunlight, Heinser produces images that make a viewer feel on the verge of sleep, as if consciousness were incrementally dimming. Even a print I happened to view under bright sun appeared light-starved. Despite the lushness of some of Heinser's images and the compositional poise of others, the show as a whole broaches a vision of a darkening world. Mike Brodie: A Period of Juvenile Prosperity: Photographs: Through Oct. 26. Stephen Wirtz Gallery, 49 Geary St., S.F. (415) 433-6879. www.wirtzgallery.com. 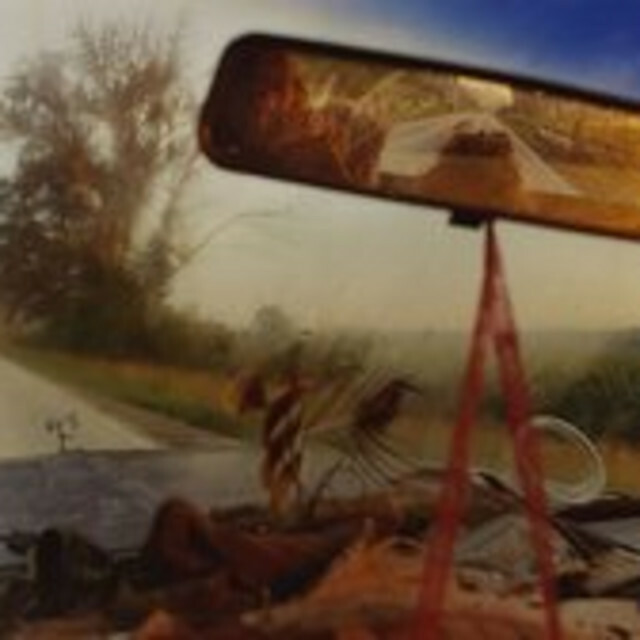 Thomas Heinser: Blickwinkel: Photographs: Through Oct 31. Gallery 16, 501 Third St., S.F. (415) 626-7495. www.gallery16.com.